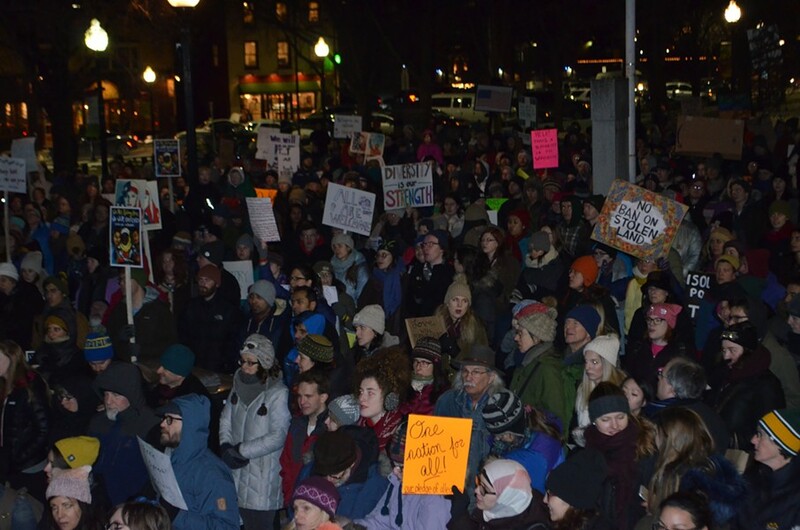 Several hundred people marched in frigid downtown Burlington on Tuesday night to air grievances against President Donald Trump’s two-week-old administration. Rights and Democracy and the Burlington branch of the International Socialist Organization organized the rally after Trump signed an executive order closing the country to refugees and people from seven countries. 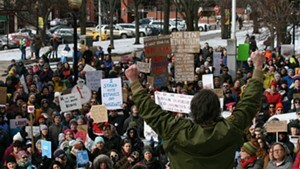 Protesters filled a large swath of City Hall Park before they marched up Church Street. “We had to do something to stand up,” said Nolan Rampy, one of the organizers. Speakers decried Trump’s plans to build a wall on the Mexican border, the executive order curtailing refugee resettlement and the administration’s bellicose rhetoric toward foreign countries. “No one is illegal; refugees are people,” the crowd chanted at one point. “Hate won’t make America great again,” one sign read. “France called, they want the Statue of Liberty back,” read another. Speakers included Winooski attorney Faisal Gill, who was born in Pakistan and is on the board of directors at the nonprofit Justice for All. The rally appeared to draw many people who don’t usually engage in political activism. Sami Jarjour, a Syrian American from Colchester, said he is usually too shy to attend political rallies and mingle in large crowds. But Trump’s refugee ban and his stance on environmental issues prompted Jarjour to come out, he explained as he marched up Church Street. “I need to take a stand. I need to get out of my bubble,” Jarjour said.